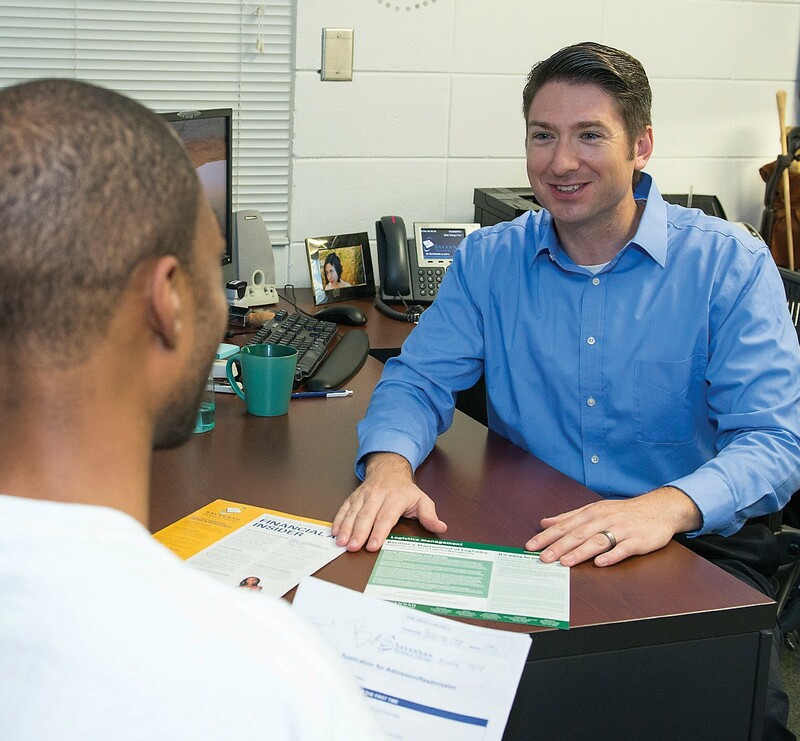 Savannah Technical College’s Director of Student Navigation Mark Stump advises a student on strategies for academic success. Savannah Technical College has added a student navigator to its Student Affairs team. This position is one of 25 created by the Technical College System of Georgia, one at each technical college, to improve graduation rates and enhance Georgia’s workforce. Improving college completion will require significant intervention to improve graduation outcomes for atrisk students. The state of Georgia has committed to Complete College America’s (CCA) goal that by 2020, 60 percent of young adults in Georgia will hold a college certificate or degree. Georgia’s Higher Education Completion plan, a joint effort between TCSG and the University System of Georgia (USG) is designed to provide a framework for action and accountability that will lead to increased college completion rates. According to CCA, low completion rates in two-year colleges are rooted in the navigational challenges that confront students. Many of TCSG’s students are first-generation college students and may not have the navigational skills to develop an academic pathway. In addition, students attending technical college are often financially challenged and frequently have family responsibilities to juggle, while simultaneously attending college, which may require being part-time rather than fulltime students. The College has selected Mark Stump as its director of student navigation. Stump coordinate and conduct focused academic advisement and student support services to help students in their program of study. Through these efforts, he will identify students at risk of dropping out by developing an early alert system and intervening with necessary support services. Stump will help students navigate the system, choose coherent programs of study and receive needed support services. He will also be the primary contact for potential students with some college classes, but no degree through the new initiative: Go Back. Move Ahead. There are more than one million Georgians who have completed some college will be encouraged to return and finish their degrees. In conjunction with the campaign, Stump will provide resources for prospective students and make the return process as accessible as possible. Stump previously served as an admissions counselor and adjunct instructor at the College for six years and was a Team Leader in the U.S. Army for five years. For more information visit gobackmoveahead.org or contact Stump at mstump@savannahtech.edu or 912.443.5706.